The TDA7240A is a 20W bridge audio amplifier IC designed specially for car radio applications. 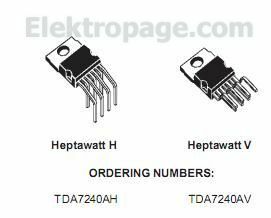 Thanks to the lowexternal part count and compact Heptawatt 7-pin power package the TDA7240A occupies little space on the printed circuit board. Reliable operation is guaranteed by a comprehensive array of on-chip protection features. These include protection against AC and DC output short circuits (to groundand across the load), load dump transients, and junction overtemperature. Additionally, theTDA7240Aprotectstheloudspeakerwhen one output is short-circuited to ground.